The Orkney pair will be joining hundreds around the world in switching off the power as part of a green living experiment. An island couple are joining hundreds around the world in spending a weekend living without electricity. 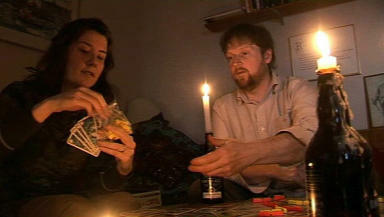 Rachel DeBois and Malcolm Handoll from Orkney will be switching off the power as part of a green living experiment. The pair will be without TV, hot water or even electric lamps as they spend two days and nights living the quiet life and playing board games by candlelight. Rachel said: "Because I'm a web designer I'm on the computer all the time. For me the ‘power off’ means I can switch it off and have no choice, but to not work, not check my e-mails and just relax in front of the fire." Due to the instant nature of most facilities these days, quite a lot of preparation is required to live a ‘simple life’. Malcolm and Rachel have made regular trips to the beach, gathering drift wood to keep the fire, which will be their only source of heat, burning. They have also been harvesting rushes (marsh plants), stripping off the outer casing and using the pith inside as wicks in their scallop shell oil lamps. Malcolm said: "I love the fire, sitting by the fire talking to friends and having that sense of relaxation. It's a holiday in my own house, rather than feeling I have to rush around and do things, just relaxing." After meeting and getting engaged to Malcolm while on holiday from her home in the USA, Rachel gave up her “corporate job” as a web producer in Washington DC and upped sticks for Orkney. She says the pairs way of life now is completely different from who she used to live. She said: I empathise with all those out there who haven’t the first clue how to cook a proper meal much less grow their own food, who never learned practical skills like how to mend a hole in your shirt or raise a plant without killing it, because that’s where I was when I first arrived in my new homeland. She says the pair enjoy coming up with innovative ways to live greener and by using less and less energy – such as putting cardboard over the windows at night to conserve heat. They post a lot of their experiences on their Torchwood Project website.